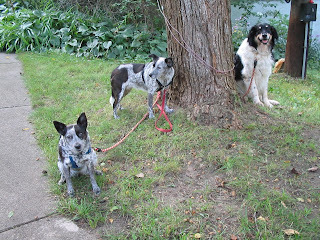 The photo is of my other dogs - from left to right, Blue, Patches, and George. This photo is a couple years old, but it's my favorite. I posted it to help clarify who I am talking about when I mention Blue or Patches or George. Gibby is not only strong, he's pretty clever, too. Since he destroyed his doggy bed, he made himself a new bed by hollowing out an oval hole in the ground in the bushes, behind a big log. It's a nice safe spot with the log to lean back against. The only thing it doesn't have is protection from bad weather. If I can't find a way to get Gibby living in the dog pen (I've been calling it a kennel, but it's really a big pen) where the dog houses are, I'm going to have to come up with a dog house for him where he is now. I'd much rather have him in the pen where he can run around without a cable attached to his collar, but so far I haven't figured out how to make it safe for him. I spent some time yesterday clearing out weeds in the pen, but there's a lot more to go. Maybe tomorrow I'll have time to work some more and get the weeds cleared away from the second dog house. I think it will be big enough for him. 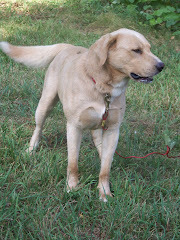 Today, I took a big bag of leftovers down to the farm for Gibby. When I got there, he had emptied his dishpan full of dry food and dumped over his water bucket. He had a wad of sticks and weeds woven into the intersection of his two cables and the sticks were grabbing the ground and acting like a brake on his dancing around. It took me a long time to unwind the cables from the sticks and while I was doing it, Gibby was paying more attention to me than he was to his food. Several times, George sneaked up to the dishpan and snatched some meat. I know Gibby saw him do it one time, but he didn't object at all. George was a little jealous when I was sitting down with Gibby and he came over to be petted, and Gibby did start to object to that interruption. I had to tell George to go away, I didn't want to get caught in the middle of a dog fight. He did go away - he disappeared! I suddenly realized I couldn't see him anywhere and I started frantically looking in all the usual places, made sure the gate was closed, called and called for him - I think he was punishing me. He eventually strutted out of the barn, head held very high. I think he was telling me not to tell him to go away because he just might. I've pretty much decided that Gibby really loves people. I can't understand how his previous owners could part with him. I was bending over, picking up the sticks that I'd pulled out of the knots in the cables, and Gibby put his face right in front of mine and gave me a couple of licks. That's a very loving dog.